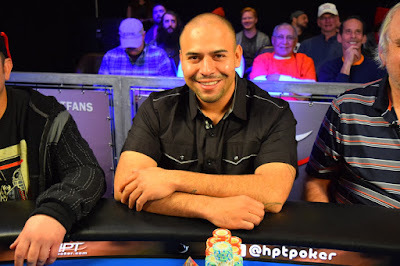 Aaron Thomas makes it 275,000 and Danny Gonzales raises to 600,000 from the BB. Thomas moves all in and Gonzales not only snap-calls but he starts telling Thomas how he was going to catch him and get him all in, and starts celebrating with friends. Gonzales continues talking and talking about how he knew this was going to happen. "I made you play bad," he says to Thomas. The flop is A - 2 - 6 ... deuce on the flop, and Gonzales goes completely quiet. The turn in a T and the river is a 7 and these stacks are very very close.